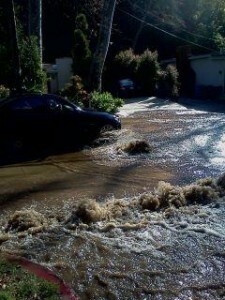 DWP will be repairing the damage to Beverly Glen done by the water main break at Corfu Lane on February 17th. DWP will have a crew on Beverly Glen Blvd to repair 380 feet of damaged roadway starting Monday, June 11 from 9am to 3:30pm and then again on Tuesday, June 12 from 9am -3:30pm to complete the work. Work will be conducted on weekdays because DWP has insufficient funds to employ crews to work overtime hours on the weekend. There will be Traffic Officers at the bottom of Beverly Glen on Sunset Blvd and at the top of Beverly Glen at Mulholland Dive. There will be a complete closure between Crater Lane and Corfu. Residents who live in the immediate vicinity will be flagged through. 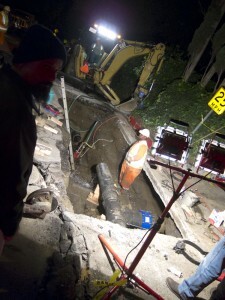 Most of you will recall the scene during and immediately following the water main break in February, and have noticed the significant and continued deterioration of the street in the 3 1/2 months since then.